Biotechnology is defined as “any technological application that uses biological systems, living organisms, or derivatives thereof, to make or modify products or processes for specific use” (Article 2. Use of Terms). When considering biotechnology in terms of art, one is confronted with the awe-inspiring but also controversial BioArt. BioArt manipulates the genetic construct of living creatures in order to enable artistic expression. As a result, many people such as Ellen Levy are battling with the question as to whether this genetic manipulation for artistic expression is ethical or humane. 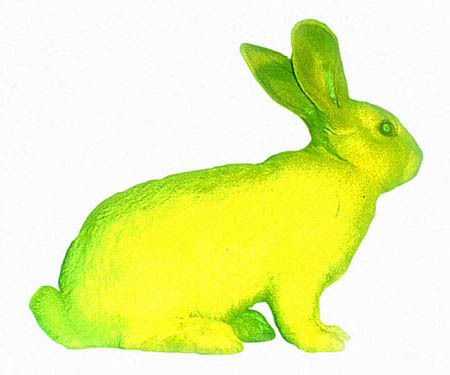 Eduardo Kac is an American artist famous for his creation of the fluorescent bunny, Alba. Kac created Alba as a method of artistic expression, but also ad a tool for testing the transferability of DNA across species. This genetic modification is the essence of BioArt, which “is a new art form based on the use of genetic engineering to transfer natural or synthetic genes to an organism, to create unique living beings” (Kac). When thinking about biotechnology and after reading Levy’s article, I cannot help but think about human cloning. Last quarter, I took an English class where we read the book Never Let Me Go by Kazuo Ishiguro. The book essentially addresses the concept of the cloning of humans solely for the purpose of providing organs and biological necessities for the naturally born humans. The book, however, is written from the perspective of the clones who are exactly like humans in terms of their construct, social norms, and emotional capacity. Although a complete cloning of a human being has not yet been developed, scientists are eagerly experimenting with the cloning of human body parts and organs. By experimenting with the concept of xenotransplantation, scientists have genetically modified pigs to grow human organs suitable for transplantation. Although utilizing pigs to develop human organs that can save lives is an amazing thing, the experimentation is also very dangerous, as there exists the “possibility of spreading viruses from one species to another” (Trivedi). Using a pig to grow a human ear. 1. "Article 2. Use of Terms." Convention on Biological Diversity. N.p., n.d. Web. 17 July 2016. 2. Levy, Ellen K. Defining Life: Artists Challenge Conventional Classification. N.p. : n.p., n.d. PDF. 3. 3. Kac, Eduardo. "GFP BUNNY." GFP BUNNY. Ekac, 2000. Web. 10 May 2015. 4. Kazuo, Ishiguro. Never Let Me Go. New York: Vintage International, 2005. 5. Trivedi, Bijal P. "Cloned Pigs Modified for Use in Human Transplants." National Geographic. National Geographic Society, n.d. Web. 17 July 2016. 1. Kac, Eduardo. Alba, the fluorescent rabbit. Digital image. N.p., n.d. Web. 2. 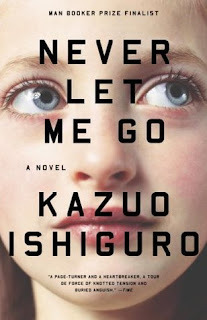 The book, Never Let Me Go by Kazuo Ishiguro. Digital image. N.p., n.d. Web. 3. 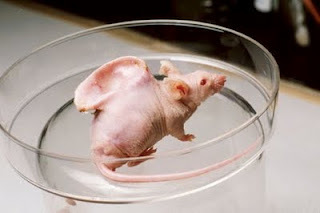 Pig xenotransplantation with human ear. Digital image. N.p., n.d. Web. I love that you brought up Never Let Me Go! I haven't read the book yet, but I did watch the movie, and it was absolutely heartbreaking. I think it brought up a great point about where we can draw the line between a "test subject" and an organism with a capacity for pain and emotion. I remember something similar in Grey's Anatomy, when one of the characters refers to her patients as numbers and has to be reminded that they are people, not just organ receptacles. Great post! I agree that BioArt is definitely a very controversial and complex subject that could be interpreted as either positive or negative depending on the viewer. Never Let Me Go seems to touch on the negative aspects of manipulating one organisms life to benefit another. These actions cause important questions about where the line between which lives should be valued, and which lives are acceptable to manipulate. You're reference to the book Never Let Me Go reminds me of a book I read in elementary school called Scorpion King. This book focuses on a single clone of a very rich man in a world where it seems he is the only man capable of creating a clone to use for organ harvesting due to his wealth. While I believe this book doesn't closely follow with biotech art, I think I agree with you and Kaelyn above on the controversy with this topic. At times there seems to be certain actions in biotech which lean frightfully towards what Never Let Go and The Scorpion King are about.